It’s been more than two weeks since the New York Yankees parted ways with Joe Girardi and the Yankees still don’t have a new manager. 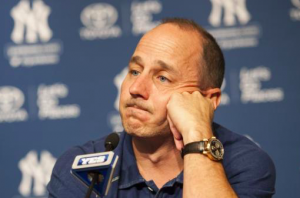 The Yankees are the only team left in baseball yet to fill their managerial vacancy. There doesn’t seem to be any timeline for when a decision will be made, and it isn’t even clear who the top candidates are at this point. Nevertheless, here’s a breakdown of the candidates we know and their chances of landing the gig. Among the candidates that we know about, Ausmus is one of the few that has managerial experience in the majors. His time in Detroit didn’t go as well as it could have, and so he was let go at the end of the season. But he’s regarded as a smart baseball person and could be able to communicate well with many of New York’s young core. Bell is a bit of a long shot, but he managed New York’s advanced-A minor league team this past season, so the organization is familiar with him. Prior to joining the Yankees organization, he was the bench coach for the Cincinnati Reds for three seasons. Boone has emerged as an intriguing candidate in recent days after reports that he was given an interview. He played more than a dozen seasons in the big leagues, and while he was never a standout player, he did hit one of the more famous home runs in Yankees history. Since 2010, he’s worked for ESPN as a color analyst, so he’s stayed close to the game even if he lacks experience as a manager or coach at the big league level. Pedrique is probably more dark horse than anything else, but he has spent the last two seasons as the skipper for the Yankees triple-A affiliate, so he’s got a chance. If nothing else, he’s familiar with all of the team’s young talent and he led some of that young talent to a triple-A championship in 2016. Other than serving as Arizona’s interim manager in 2004, Pedrique lacks managing experience at the big league level. Thomson’s chances of being hired declined when the Yankees didn’t make a quick decision. But he should still be considered a legitimate candidate. He’s been with the Yankees in one capacity or another since 2008, most recently serving as the team’s bench coach. If loyalty means anything, Thomson has a shot at landing the job. Wedge wasn’t on anybody’s radar until it was reported that he received an interview. It still seems odd that he would be a serious candidate, but he does have 10 years of managerial experience in the big leagues. He even won Manager of the Year in 2007. Wedge will turn 50 in January, so he’s by no means old. It wouldn’t be surprising to see him become a big league manager again. It’s downright crazy how many people could come out of the field and potentially get this job. Former managers like Dusty Baker, Manny Acta, Fredi Gonzalez and Pete Mackanin are possibilities, albeit remote ones. Former players like Joe McEwing, Raul Ibanez, and Jerry Hairston Jr. could gain consideration. Coaches like Tony Pena or Bob Geren can’t be ruled out. Even former pitcher and current Yankees broadcaster David Cone has thrown his hat into the ring. It wouldn’t be shocking to see someone from this group actually get the job.